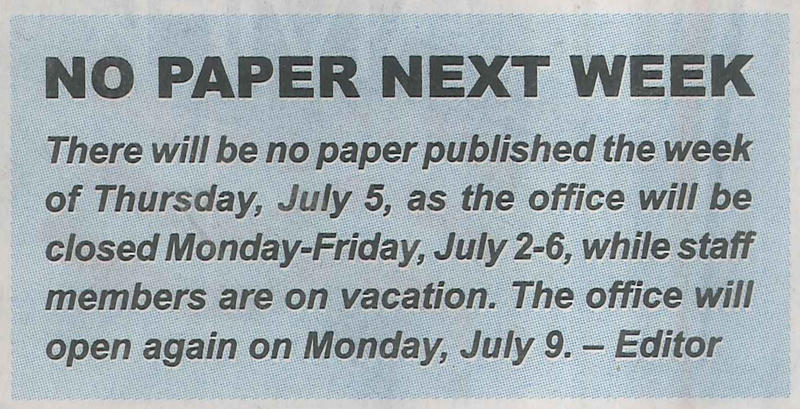 For decades it was customary for weekly newspapers to take one, maybe two, weeks off from publication each year: most often the week after Christmas, but also a week in the summer, often the week at the end of June or the beginning of July. We thought about that this week as we prepared to move the office of the Institute for Rural Journalism and Community Issues at the University of Kentucky and give The Rural Blog some days off, or days with lighter lifting, through mid-July. a week off in the summer. It's owned by the Kinner family. 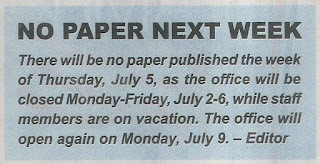 The weeks-off phenomenon reflected the former nature of weekly newspapers, which were largely family operations, many lacking the staff to fill in for a vacationing editor or publisher. That was probably one reason that a postal regulation required newspapers with second-class (now Periodicals) mailing permits to publish not 52 weeks a year, not 51, but 50. The week off in the summer helped facilitate, in the late 1950s, establishment of the International Society of Weekly Newspaper Editors. ISWNE will hold its annual conference next week at Lewis and Clark College in Portland, Oregon; it meets on college campuses because dormitory space is available in the summer, and much cheaper than hotel rooms. It's always an inspiring meeting.